Arenal Volcano is one of the youngest yet most active volcanoes in Costa Rica, situated in the Alajuela province, near the small town of La Fortuna. The area is considered a paradise for adventure lovers and nature enthusiasts alike. Activities include but are not limited to canopy tours, aerial trams overlooking the jungle, white water rafting, kayaking, fishing, hiking, ATV tours, and hot springs resorts just to name a few. Or if you are just in the mood to relax and catch your breath, you can listen to the rumbing of the ground underneath, and gaze at the plumes of dust that rise from the volcano. Arenal is approximately 90 kilometers from San Jose, and travel time by car or bus will generally run a minimum of 3 hours, depending on traffic and weather. For this reason it is recommended that you leave early in the morning. If you are short on time, you might consider taking a plane from Tobias Bolanos National Airport in San Jose, to the La Fortuna area. The cost is approximately $80 each way and/or $160 roundtrip, not counting added expenses such as transport to and from the airport. Travel by bus albeit a more economical option, is not recommended if you are travelling with luggage or valuables, as it is less secure than the shuttle service. Also, for elderly passengers or those that are more sensitive to the elements, it should be noted that public buses generally do not have air conditioning, and tend to make many of stops along the way, thus making for a longer trip overall compared to the shuttle service option. 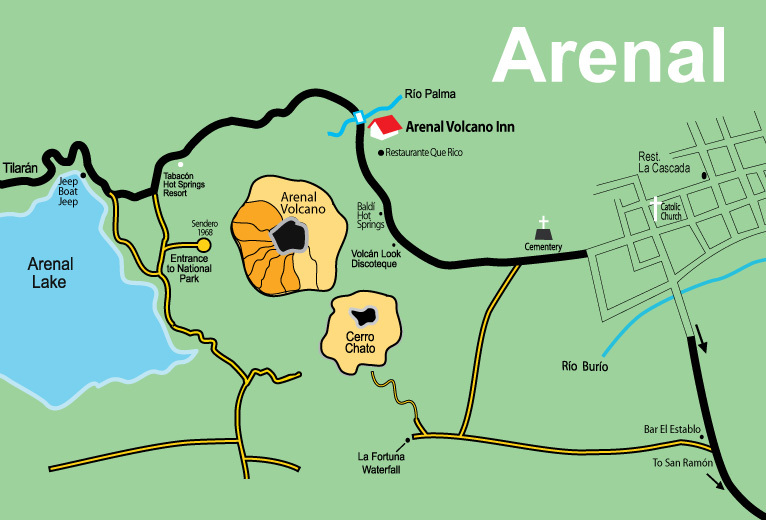 Shuttle service to and from Arenal is a highly efficient, safe and comfortable option. In most cases the shuttle routes operate on a daily basis with multiple departure times. It is important to note that shuttle buses unlike a public bus, are more secure, direct, and comfortable as they are equipped with air conditioning and offer more personal attention to passengers and more direct routes translating to shorter travel times. The shuttle service is often booked days in advance by visitors so it is important to reserve your seat in advance to ensure availability. If you opt to go by car, you will actually be driving to La Fortuna, a small town just a few kilometers east of the Arenal Volcano National Park. En route you will be passing dairy farms, majestic rolling hills, and lush green pastures, as well as rainforests. And you will pass many towns such as San Ramon, Bajos de Los Rodriquez, and Santa Clara. Although there are many ways to get to La Fortuna, we are going to focus on the most direct and secure route. Here are the driving instructions to La Fortuna, home of the Arenal Volcano from the capital city of San Jose, Costa Rica: Take highway 1, also called the Pan-American Highway or Inter-American Highway towards Juan Santamaria International Airport. As you approach the airport, driving east from San Jose you will pass a toll both, the fee is 100 colones, but depending on time they do not always charge. Be sure to pay attention to signs that read to San Ramon as you pass the airport and head out. From the airport you must take highway 1 toward Guanacaste. Along the way you will pass several intersections, such as Aetenas, Grecia, Naranjo, and Palmares, but do not exit highway 1 before you reach San Ramon, which is about a 42 kilometer hike out of the airport. As you approach San Ramon you will turn right off of highway 1 and enter the town limits. There will be a large commercial building painted brown, which is a mall as you exit highway 1. Keep straight for the next 1.7 kilometers until the road ends and then make a left, and proceed 200 meters until the next light. Then at the light make a right toward the San Ramon Hospital. Then you will be heading out of San Ramon on a secondary road, passing several small towns en route to La Fortuna, such as Los Angeles, Bajos De Los Rodriquez, and Santa Clara. When you get to Bajos De Los Rodriquez you will come up to a fork in the road where you will run into an old voluntary booth (illustrated in the youtube video that we have provided below) where you have the option of making a right or a left. We recommend that you make a right, as the road is more direct and secure, although both will get you to Arenal. After you turn right, you will continue on to a small town called Santa Clara. As you approach Santa Clara town limits, you will need to turn left (you can follow with the youtube video, as we illustrate the turn, avoid the dirt road on the right) Immediately after you turn left, you will notice a soccer field, and then about 60 meters on, you will see a large soccer ball on the right that is difficult to miss. After Santa Clara, the main thing to look out for is a cross point in Javillos. Be sure to continue straight when you get to the cross point, and then continue on to La Fortuna. As you head to La Fortuna, you will pass several more very small towns, like La Vega, La Perla, and El Tanque. Once you reach El Tangue, La Fortuna is about another 7 km out. For your convenience, we have also included a youtube link, http://www.youtube.com/watch?v=C8PVpi7RV4E, courtesy of Expediciones Tropicales and Arenal Volcan Inn, with step-by-step driving directions to the Arenal Volcano.Be prepared and for at least a 3 hour drive, albeit scenic. And by the way, if you have any questions you can call the Arenal Volcano Inn for assistance, and/or Expediciones Tropicales at (506) 257-4171/257-4133, specialists in hotels, tranportaion, tours and all things Costa Rica. Vistors to the Arenal area have many options available to them in terms of transportation. Some rent a car and drive in from San Jose, or others might go through a tour operator, that offers transport to nearby attractions, such as the hot thermal springs, and or the small town of La Fortuna, near Arenal Volcano National Park. Although bus service to La Fortuna is reliable and plentiful, in the La Fortuna area, bus service is infrequent, and not recommended as reliable transport option to and from sights. Prices range start at around $23/day for a compact car, $36/day for a compact, and $65/day and up for a full size SUV, depending on whether it is a 4×4, as well as the model. Please keep in mind that these prices do not inculde the mandatory insurance. Rental of a bike will run you around 19/day or around 126/week and can be a good way to get around if you can handle a bike well, as there can be a lot of traffic on the main road to Arenal Volcano National Park, and to the nearby hot thermal springs. Arenal offers many opportunities to explore nature, such as scenic hiking paths, as well as waterfalls, thermal hot springs, and of course, Arenal Volcano National Park, feaurting Arenal Volcano, one of the most active volcanoes in the world.